Many people wonder why martial arts are practiced by religions like Buddhism and Daoism that teach about compassion and humility. The idea of a warrior monk seems contradictory because in people’s minds the martial arts are linked with violence. Many people wonder why martial arts are practiced by religions like Buddhism and Daoism that teach about compassion and humility. The idea of a warrior monk seems contradictory because in people’s minds the martial arts are linked with violence. But violence exists first as an emotional state before it manifests through action. People need to understand that it is possible to be completely still, but have a heart full of violence. At the highest level of practice, it is also possible to wield a sword with a calm and peaceful heart. Daoist martial artists use these skills only when necessary to prevent or stop violence. Martial arts also teach a lot more than how to protect your physical body; it shows us our weak spots and pushes our physical and emotional limits. When training martial arts, you are learning to set aside anger, impatience, selfish desire, and hatred. In ancient times, every Daoist had his or her own sword to be used for martial practice, self defense, or for ritual purposes. In Daoist rituals, swords are often wielded as symbolic weapons to subdue evil forces. Traditionally swords were given to traveling Daoists to symbolize cutting away their attachments to the material world. In Daoist qigong practice, when energy is gathered and moved throughout the body, it is described as a sword opening the body's energy pathways. In Daoist practice, the sword is not seen as a tool for killing enemies. It is a symbol of justice and righteousness, and represents the discipline used for conquering ignorance, reckless passion, and aggression. There are three Daoist sages that are commonly associated with the sword, Lu Dong Bin, Zhen Wu, and Zhang San Feng. Lu Dong Bin (呂洞賓) also known as the "Sword Immortal" was the most famous of the Eight Immortal Daoist sages of the Tang Dynasty. 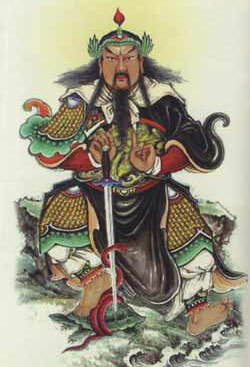 His legends are recorded in the "Chronicles of Ancestor Lu." Lu Dong Bin (呂洞賓) It is said that when Lu Dong Bin traveled through the mortal world, he would disguise his sword into a beautiful woman, who traveled by his side. Zhen Wu (真武祖師) The second sage associated with the sword is Zhen Wu (真武祖師). Zhen Wu is the patron saint of Wudang Mountain; his name means "Perfected Warrior." Zhen Wu can be recognized by his long, unbound hair and bare feet, as well as by the armor he wears underneath his Daoist robes, and the sword he carries. Zhen Wu is said to have been a prince who lived and attained enlightenment on Wudang Mountain. Zhang San Feng (張三豐) According to legend, Zhang San Feng (張三豐) drew inspiration from Zhen Wu and created sword techniques to protect the Dao and fight evil. Originally shared within the Daoist community, the Wudang style of swordsmanship has passed down through the ages and is now accessible to the outside world. The history of the sword traces back to the time of China's Yellow Emperor. In his Ming Dynasty work, the Famous Sword Classic, Li Cheng, Xun quotes an earlier manual called The Records of the Emperor's Movements East saying "The emperor cast a weapon in copper from Mt. Shou, and engraved it with constellations and ancient characters. On Mt. Lu he used this weapon to defeat Chi You, and named the weapon “jian" meaning “sword." Sword technique and theory can be traced back to the Warring States Period (475-221B.C.) when wars were frequent, soldiers fought on foot and horse, and the rise and fall of a kingdom was determined by the skill of its warriors. From this time period, we have a sacred text which tells the stories of the Daoist philosopher, Zhuang Zi. A chapter in the Zhuang Zi called "Delight in the Sword Fight" tells of a King Zhao, who loved the sword, and recruited 3,000 swordsmen who would spar with each other day and night. Although hundreds were killed, King Zhao was pleased. Although the king's actions were reprehensible, this story reveals that sword training has been popular for thousands of years. During the Qin and Han Dynasties (221-220 B.C.) the sword reached an unprecedented level of development. The emperor, civil and military officials, high-ranking officers, and scholars all regularly wore swords. By the Tang Dynasty (618-907 C.E.) scholars were referring to the "Three Great Arts," painting, poetry, and the sword. Swords were worn as a cultural symbol to express the status of the wearer. Later came the invention of gunpowder and the tools of modern warfare. While historically it was considered the most valued weapon on the field of battle, the role of the sword has changed over time. Thousands of years later, the sword is still seen as a manifestation of strength, power, privilege, and ability. Practicing the sword is an essential part of Chinese martial training, and sword is the weapon that martial arts students like the most, but behind this one weapon there are many types of sword forms, and every martial arts lineage has their own basic principles and training techniques. But for all styles, the first step to practicing the sword is to understand your weapon. The sword is the king of all weapons. The traditional Chinese saying, "100 days of bare hand, 1,000 days of spear, 10,000 days of sword” places mastering the sword as the highest achievement in martial arts. Like other weapons, the sword can be used to lengthen the range of your movements and increase your strength and force. However, the sword demands an unparalleled level of skill. Unlike other weapons which use brute force to clash and overpower, when wielding a sword your attacks must be precise, and your movements light and quick. But as demanding as the sword can be, if you can persevere with your training you will be rewarded with a faster response rate, endurance, flexibility, and a calm, focused mind. From ancient times, Wudang Mountain has earned prestige for its sword practices. In kung fu legends, Wudang is associated with the sword just as Shaolin is associated with the staff. There are several different Wudang sword forms including the Tai Yi Daoist Sword, the San Feng Taiji sword form, the Eight Immortals' Sword, the Changing Dragon sword, which all come together to form the Wudang style of swordplay. Wudang sword is similar to the other martial arts practiced on the Mountain. All are internal style, which avoids direct clashes with the opponent and instead relies on quickness and rounded movements that block attacks and borrow the opponent's power. The characteristics that define Wudang style make it a perfect match for the sword. Swords have flexible blades which are not meant to meet force with force; instead a swordsman should deflect and redirect blows before moving to strike. The nature of the weapon lends itself naturally to the principles of the Wudang arts, and combination, the style and the weapon both reveal their greatness.